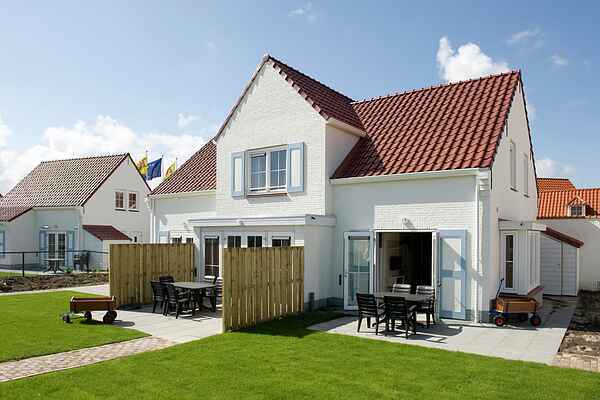 These modern and comfortable accommodations are spread across North Sea Residence Cadzand-Bad, which boasts a spacious layout. You can choose from a variety of different types in the recently completed phase. For example, there is a detached 6-person luxury villa with a bedroom and bathroom on the ground floor (NL-4506-33). There are two 8-person variants, both with a bedroom and bathroom on the ground floor and an infrared sauna on the first floor; a detached 8-person luxury variant (NL-4506-34) and an 8-person link-detached variant (NL-4506-35). There is also a 9-person link-detached villa (NL-4506-36). This is located in a three-house row and is spread across two of the three houses. The two different units are reached through a shared corridor, though they both have their own front door. You have two kitchens and two living/dining rooms. The ground floors are connected with interior doors. This is ideal if you are holidaying with a group of multiple families, so you still have your own space but can mingle as you wish. Finally, there is a luxurious, detached 10-person villa situated on the water (NL-4506-37). This villa has a bedroom and bathroom on the ground floor and also has a dock with a rowboat, an infrared sauna and an Xbox 360. All accommodations include a garden with a (covered) terrace and garden furniture. In addition to these types, there are even more accommodations available at North Sea Residence Cadzand-Bad.